KG: Hello, I’m Kendall Gammon. This is Real Talk with Real Media. 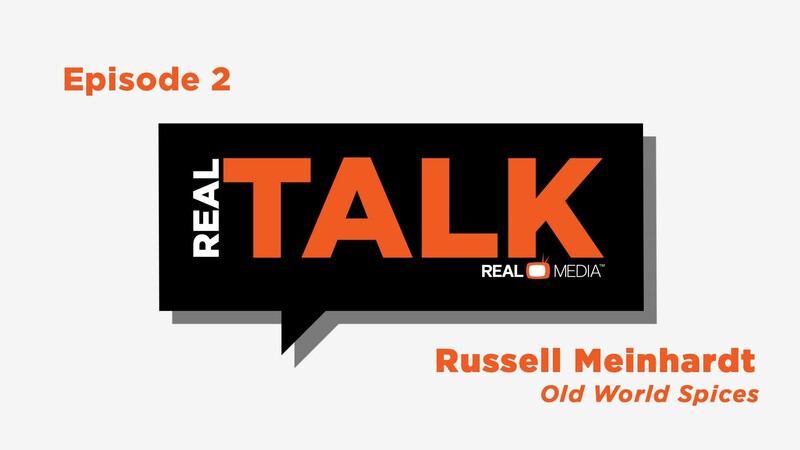 Today I’m joined by Russell Meinhardt of Old World Spices and Seasonings. Russell, I appreciate you joining us today. As we look at this unique business in the barbecue world, and the seasonings in general, tell me a bit about your history and how you got to where you are. RM: So the organization was started about 30 years ago by my father-in-law, myself and my two sister-in-laws. We were distributing spices and seasonings to small and medium-sized food manufacturers around the Midwest. Our customers just kept coming back to us because we were providing great service, and they kept asking us to do more and more so it just has allowed us to continue to grow and expand our product line, and now we’re a nationally distributed barbecue company all across North America, Europe and Australia. KG: That’s really amazing when you talk about the global reach, yet it goes all the way back so many years ago, so many decades ago, to it growing because of the service and how you did things for people the right way. KG: As you look to the future where are you trying to go? RM: I think our growth comes through our consumers. Consumers now are more interested and focused on where’s their food coming from, what’s going into their food. The flavor trends have always been changing over the years, so that provides opportunities for us because we continue to act like a small company but have some larger capabilities. KG: When you look at Old World Spices, what is it that you guys do so much better than others? RM: I think we’ve built out a set of capabilities that kind of rival our biggest competitors. Building those types of capabilities allows us to grow. When you talk about growth of 10, 20, 30% or even trying to double yourself over a number of years it becomes very difficult in some of those if you don’t have the processes in place, and the capabilities. The business can kind of falter and kind of slow those types of growth opportunities. KG: I think that’s something you see sometimes in companies. Obviously, you’re trying to get as big as you can, be successful. But being a little bit smaller allows you maybe a little more nimbleness. RM: Oh yeah. It’s kind of the aircraft carrier versus the speedboat approach of we’ve got a big, large organization that quite can’t turn quick enough or keep up with consumers’ needs so we feel like we’ve got a speedboat, but we’ve got a speedboat with a couple outboard engines that we wouldn’t go really fast. KG: Very nice. Yeah, you talk about the consumer needs, and the fact is when you can respond to problems, issues, or even the RND of doing more, and coming up with things better, you’re able to do it at maybe a fashion that just maybe some bigger companies don’t have the capabilities to do. KG: It seems amazing to me that you’re right here in Kansas City, yet you reach out all over the place. RM: Yeah, and really Kansas City is a great place for barbecue, but what we want to do is be able to take that great sense of barbecue history and authenticity out to the masses beyond Kansas City, and expose people to the great Kansas City barbecue. KG: We’ve talked about the past, we’ve talked about some of the things that you do as a company. How about the future of the organization in the years to come? Where are you going? RM: You know, I feel like our growth has just continued to be a great opportunity for us when consumers’ tastes are changing, we look at the capabilities that we hae to be able to be nimble enough, to take advantage of those opportunities with consumers’ tastes and their focus on what consumers are putting into their bodies these days. KG: When you look at some of your customers, certainly you’re always trying to acquire new customers and you can grow that way. But I would think also helping your current customers do the best they can and maybe help them grow internally as well. Is that fair? RM: Yeah, and that’s where we’ve built out a lot of capabilities that aren’t just about producing more product, or producing it faster, but it’s about how do we help our consumers sell more of their products that we’re making for them? KG: We’ve had a great talk today. A lot of different things going on in terms of where you’ve been, where you’re heading. But one thing that I think is so important, and you’ve talked about, is the culture of your organization. It helps the growth. But, why is culture so important? RM: I think culture comes down to people and the people that work within the organization are what’s going to grow the organization. If what they believe and how they think about the organization isn’t conducive to growth, then the people aren’t just going to have their … they’re not going to be aligned, and either they’re going to leave, or you’re just not going to be able to find the right people. That’s why I really feel like culture is so important for growth because it gains people’s alignments within their organization, and helps the organization grow. KG: Certainly, you don’t like to have attrition because that doesn’t help anybody and the fact that it sounds to me what you’re saying is when you do things the right way, and you create an environment that people want to be in, that helps keep them … Number one, helps them stay there longer; And two, probably helps them be more creative which I would think you need in your business. RM: Yeah, you know and just alignment and growth, and kind of how people think about their daily jobs and what they need to do. Having that alignment in culture towards growth is very key. KG: I’ll say this also, is culture … From your side of the business, do you see yourselves helping the culture of your customers at some point in time as well? RM: Yeah, you know the customers look at us and they may emulate some of the things that we’re trying to do for them. It’s definitely a key aspect for our business. KG: You know, this is a company that’s in the Kansas City area, and you like to give back. Talk to me about what Old World Spices does for the community. RM: As a food business we feel like we’ve got a great opportunity to feed people. We provide donations to City Union Mission, Bishop Sullivan Center, Harvesters-a great organization. But what we kind of do a little bit different is normally there’s giving times of the year, we try and look at those opportunities outside of the normal giving times of the year so we provide maybe when there’re lean times for those types of organizations, we’re providing them foods to stock their pantries and give back to the community in that way. KG: You know, that’s fascinating because what I think I hear you say is you’re trying to create a culture, which we talked about earlier, of giving back at times and maybe trying to create new avenues for people and really lead by example in different times of the year. RM: Yeah, and it flows down to our customers as well as our employees in demonstrating the giving back to the Kansas City community. KG: That’s awesome and we can’t thank you enough. I appreciate you joining us today. I’m KG. This is Real Talk with Real Media.